Ejection port cover kit for AR15 Upper Receivers. Made in the USA!! 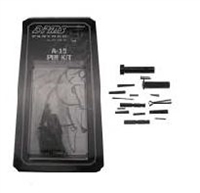 This Forward Assist Assembly Kit fits both AR15 and M5 .308 Upper Receivers. Made in the USA!! Complete Delta Ring Kit. Includes weld spring, snap ring and slip ring. 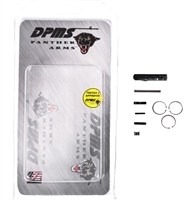 DPMS kit includes: takedown pin, selector detent, front pivot pin, takedown detents, rear base spring pin, bolt catch roll pin, trigger guard pin, extractor pin, ejector roll pin, gas tube roll pin, rear base spring pin, forward assist pin, trigger pin, hammer pin, and firing pin retaining pin. AR15 complete mill-spec 5.56mm upper parts kit. Made in the USA! !